Definition: A tumor consisting of enamel, dentin, cementum and pulp tissue. A compound odontoma will have defined tooth-like shaped entities (denticles) within the lesion. Location: Maxillary anterior region is most common. Shape: Tooth-like shape radiopacities within the lesion. Internal: Mixed radiolucent/radiopaque with radiopacity of tooth structure (enamel and dentin). Other: Commonly prevents normal eruption of permanent teeth. Number: Single. Multiple is rare but possible. Periapical radiographs – note the multiple well-defined tooth-like structures in the left anterior mandible. 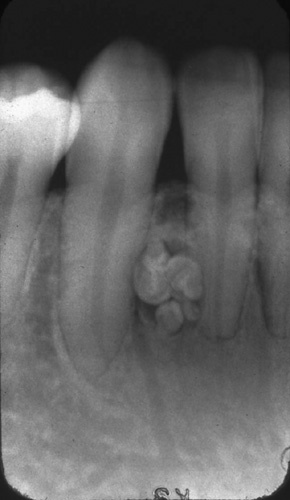 Periapical radiograph – note the compound odontoma between the canine and lateral incisor roots.